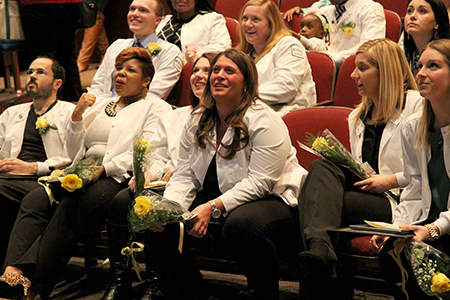 West Windsor, N.J. -- Handshakes, hugs and tears marked the end to a long and challenging road, as the 29 graduates of the Mercer County Community College (MCCC) Nursing Class of January 2016 celebrated with faculty and loved ones at a graduation and pinning ceremony on Jan. 12 at Kelsey Theatre. Said graduate Danielle Franks, “It has been an amazing experience. We have become like a family. Our professors have wanted to see us succeed. The work ethic we developed will help us as we prepare for our national boards.” Franks added that she has had a passion for helping people since she was a child and earning her associate degree in nursing is a dream fulfilled. Ultimately she plans to become a nurse practitioner. Bannwart, who came to Mercer after having already earned a bachelor’s degree, chose to pursue a nursing career because of the wide range of skills it requires. “You must apply yourself in so many ways – as a problem-solver, an advocate, a critical thinker and a care giver,” he said, adding that his initial unease in the clinical setting eventually grew into confidence as he observed and learned. He was so intrigued by the professionalism of the hospital staff during a code blue emergency that he plans to become an emergency room nurse. Also participating in the ceremony was Dr. Eun-Woo Chang, MCCC's Vice President for Academic Affairs, who encouraged the grads to represent Mercer with distinction. 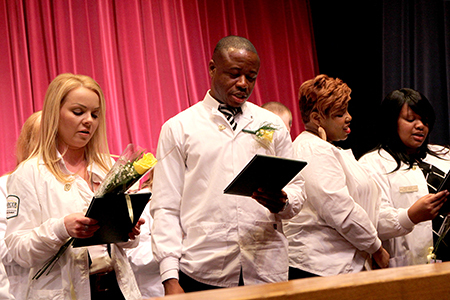 Director of Nursing Donna Penn was the mistress of ceremonies and pinned the students in the traditional rite of passage from student to graduate. A large number of nursing faculty members also turned out for the event. 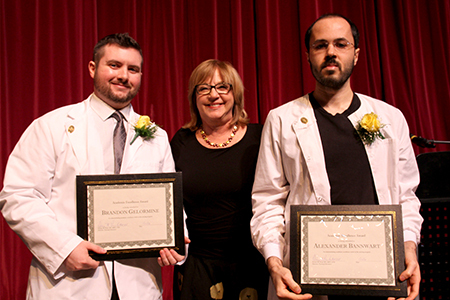 A number of graduates were selected for special awards: Samantha Wagner (HelenMarie Dolton Clinical Excellence Award); Nora Kent (Clara Lidz Nursing Leadership Award); Kathleen Gavin (Nightingale Award); William Swisher (MCCC Nursing Faculty Award); and Alexander Bannwart and Brandon Gelormine (Academic Excellence Awards). The graduating class included: Alexander Bannwart, Marie Benedetti, Dayana Diaz, Danielle Franks, Chelsea Furch, Kathleen Gavin, Brandon Gelormine, Estefania Granada-Gonzalez, Suzanne Harris, Marcella Isaacs, Matthew Jaworsky, Shawn Kemble, Nora Kent, Lindsay Korwin, Sofiya Kozak, Adriana Lazo-Brito, Elizabeth Lee, Britney Mantone, Precious McClees, Alexandra Misuraca, Michael Mulvan, Kathy O’Neal, Aingye Oliver, Chantel Ramsey, Gibril Sandy, Dominika Strakos, William Swisher, Neven Tadros and Samantha Wagner. 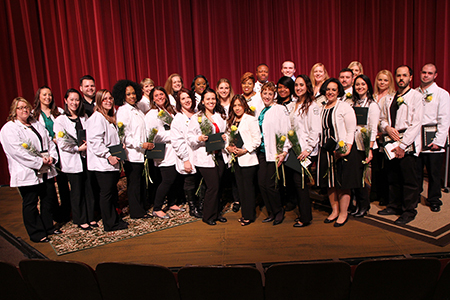 Presenting MCCC's January 2016 Nursing graduates. Brandon Gelormine, left, and valedictorian Alexander Bannwart were the recipients of Academic Excellence Awards. They are pictured with faculty member Toni Racioppo. Graduates recite the Nightingale Pledge. Pinning is a tradition at the graduation ceremony. 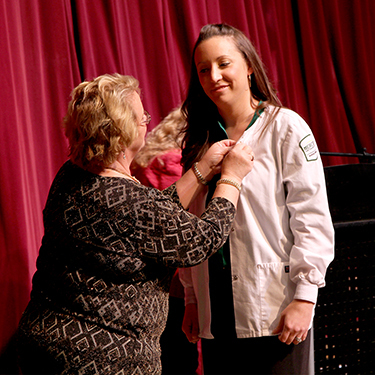 Director of Nursing Donna Penn does the honors for graduate Samantha Wagner. Students enjoyed watching a video montage of their time at Mercer. The eight-minute video was produced by Danielle Franks, center.